I was in Taxco, Mexico in September for two days. I wanted to get a nice photo of the skyline at sunrise or sunset. My hope was to feature the church of Santa Prisca, which is one of the best examples of Mexican Churrigueresque style. I booked a hotel with a good view. When arrived, I found that the church was covered in scaffolding due to earthquake damage and wasn’t being lit at night. With the the church under repair, I fell back on photographing an old standby — the local taxis. Taxis in Taxco are most often white VW Beetles. The driver completely removes the front passenger seat so that passengers can get in the passenger door and sit in back. 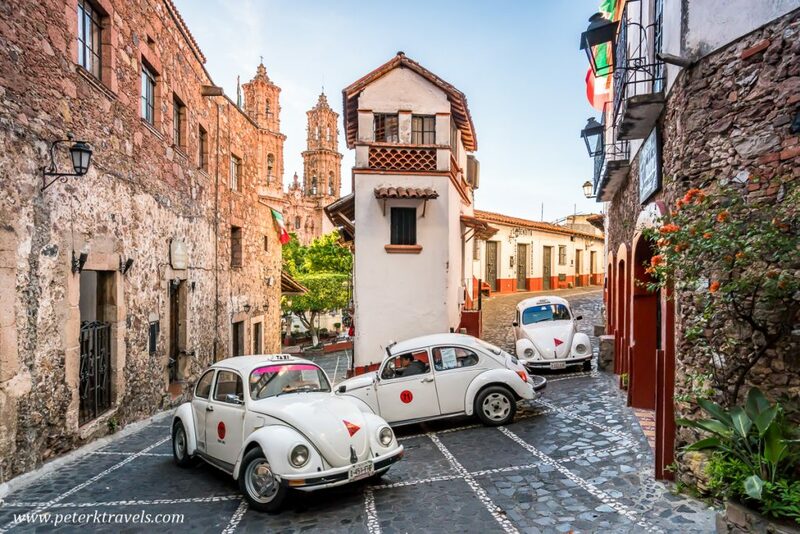 Beetles are small, so they fit through the narrow streets well. Apparently, they also climb well, which is important in hilly Taxco. After riding in a couple, I found out the local name for them is “vocho”. There’s a particular street near the square where taxis come around the corner, but they can’t make the turn without stopping and backing up. The road is two way, but narrow — sometimes, you’ll have taxis coming from both directions. When this happens, an intricate dance begins as they move around each other negotiating the corner. What if you could get three taxis trying to get around the corner? Well, that would be something. I staked this area out two mornings in a row, and waited for taxis. I like early morning for photos like this, as there will be fewer people in them and the light isn’t so harsh. It took awhile, but I finally got three taxis negotiating the turn at the same time. Next time, I’ll hope for four! 2 Responses to "Los Vochos"
Hi Peter, I really enjoyed reading this. I am heading to Taxco for a week (I paint). It looks absolutely beautiful. Thank you for sharing this and photos from other trips. It’s a wonderful place, I hope you enjoy your time there!